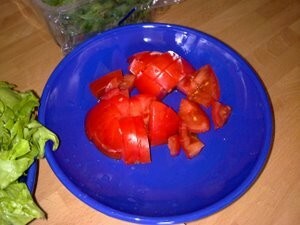 Wash the tomatoes and chop it into smaller pieces. 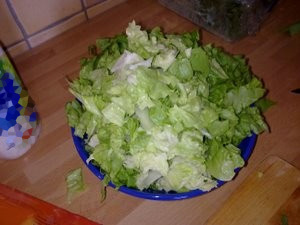 Wash the salad, chop it and put it on a plate. 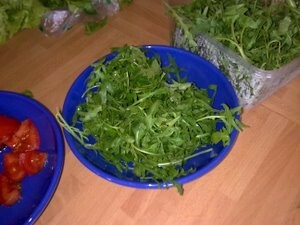 Wash the rucola (rocket) and put it on a plate. 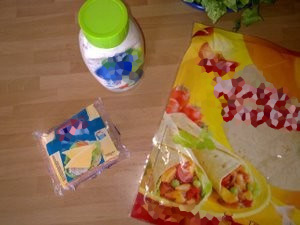 When done wit the veggies prepare the yogurt dressing, cheese and tortillas. 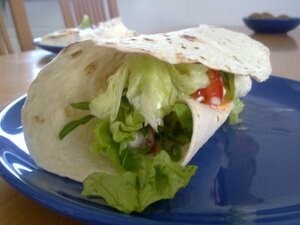 If you have 30 extra minutes to spare, I suggest you to make your own tortillas, it's super easy. Let's now proceed with the chicken. Put the frying pan onto the hot plate with the highest temperature set. 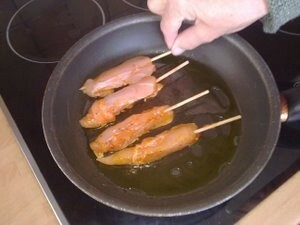 Add 2 spoons of olive oil. 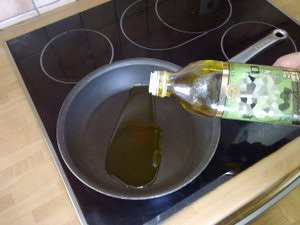 If you don't have olive oil you can use any other vegetable oil. Now bring out the chicken. I used the chicken skewer that was already seasoned. You can use the regular chicken breast meat, cut into smaller pieces add a bit of salt, pepper, lemon juice and minced garlic. 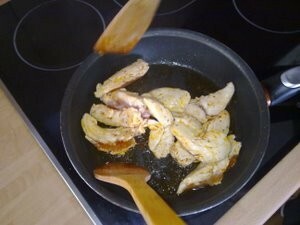 Put the chicken into the pan with heated oil. Don't over heat the oil. Put the chicken in before the oil starts smoking. Stir the chicken a few times so it cooks evenly all the way through. You can cut it in the middle of cooking into smaller pieces like I did, but I suggest you to cut it before you put it into the frying pan. Cook it until it turns golden brown. You can add some extra seasoning as well while you are cooking and stirring. When done, put the meat into a bowl or plate. 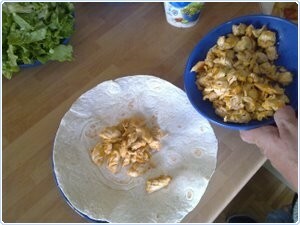 Now put the tortilla onto a bigger plate or and start adding the ingredients. 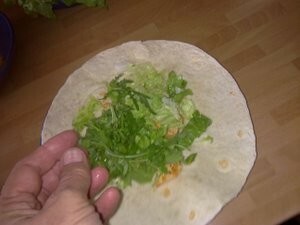 You can heat the tortillas a bit as well. 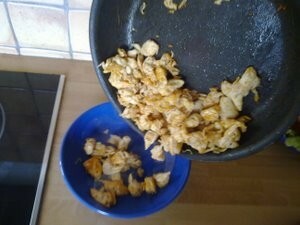 Put them into the frying pan for a minute (30 seconds on both sides). A few pieces of cheese. 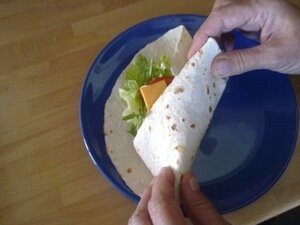 Now simply wrap the tortilla like I did. 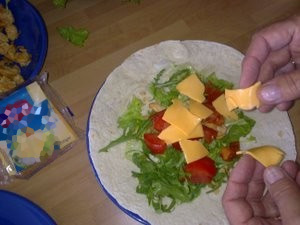 Important part is to fold one end of the tortilla over the ingredients before you start wrapping it so the stuff won't fall out when you will be eating it. 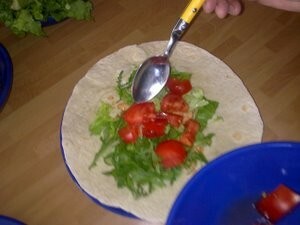 Pour some yoghurt dressing into the tortilla or not if you like a more "natural" taste. And we are done. Hope you like it! I have tried it at home and it is delicious. Much better than in restaurants. Also it takes really just 10 or 12 minutes. You can add also other ingredients. It's great when there is not time.